Dr. Swathi Gogineni is a Gynacologist&Obstetrician and Infertility Specialist, currently Practising at Apollo Cradle Jubilee Hills, Cradle Clinic Manikonda & Astra Health Care OU Colony. 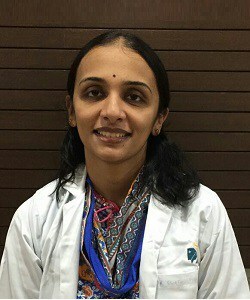 She has Completed her MBBS and Masters in Gynaecology & Obstetrics from Osmania Medical College Hyderabad, then she has completed her DNB in 2009. She has total 9 years of experience after Post Graduation. She has done her fellowship in Infertility from Apollo Hospitals Chennai. She is trained in Obstetric practice gynaecological laparoscopic surgeries and IVF Procedures.